Spending hours in front of a computer monitor can take its toll on your eyes and your posture. EyeLeo is a free utility that tries to help by providing gentle periodic reminders to exercise your eyes, or get up and move around. EyeLeo's settings dialog is simple and straightforward. EyeLeo defines two types of breaks: Short ones, and long ones. By default, a short break reminder pops up every ten minutes. "Short" is the operative word here: The reminder stays on screen for ten seconds, and shows a quick eye exercise for you to do in that duration. Exercises include shutting your eyes tightly, rolling them around, looking from side to side, and focusing on distant objects. I found these fun and helpful: The reminder window is small, and since it only stays on the screen for a moment, it is easy to ignore when I'm busy. Long breaks are five minutes long by default, and EyeLeo wants you to have one every hour. You can configure both the interval between breaks and their duration in the EyeLeo Settings dialog. During a long break, EyeLeo dims your entire screen, so there's no way you could miss it. 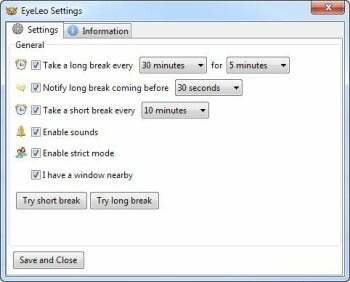 If you find yourself dismissing the long break reminder, you can switch on EyeLeo's strict mode. In this mode, there is no way to dismiss the long break reminders: Your screen dims and you simply must get up and walk around (or sit and stare at your monitor counting down the minutes). EyeLeo's mascot shows you how to exercise your eyes. EyeLeo's strict mode sounds like a nice idea, but when I tried it, the break reminders popped up in very inconvenient times. I was just getting in the groove of an extended writing session, and suddenly my screen blacked out and EyeLeo effectively locked me out of the computer. Turning strict mode off fixed this, and I could to postpone long breaks as needed. EyeLeo is a fun and simple way to remind yourself to rest your eyes every now and then. And if you don't constantly dismiss the long break reminders, you may even find yourself getting up from the computer every now and then. Small utility EyeLeo reminds you to rest your eyes and take a break now and then.